This page will help you to quickly learn the main features of Print2Flash and how to work and benefit from it. Print2Flash lets you easily convert any printable document (Microsoft Word, or Excel, or PowerPoint document) to an Adobe ® Flash ® file (file with SWF extension) or to HTML page or SVG file. This file can be shared with users who don’t have the software that created the original document (for example, Microsoft Word). You can view such files with virtually any web browser or Adobe ® Flash ® Player that is available across a number of operating systems. These files can be easily published on the Web as well for fast and easy access to them anywhere across the globe. The best way to get help on Print2Flash is its help system. Consult it in case you need more thorough understanding of Print2Flash toolbars, dialog boxes and windows, have questions or to learn how to accomplish typical tasks. To access the help system press F1 key in Print2Flash dialog boxes and windows or click Help button that brings you right to the respective help topic on those windows. You may also press Help button on the converted document toolbar or select Help/Print2Flash Help in printing application menu or choose "Print2Flash Help" from All Programs/Print2Flash submenu of Windows start menu. If the help system provides you with no answer, visit our web site http://print2flash.com or apply to our support service to support@print2flash.com. Click here to find out more about Print2Flash support. Shortly afterwards you should see the progress window which shows you that the conversion process is taking place. Please wait until it is finished. 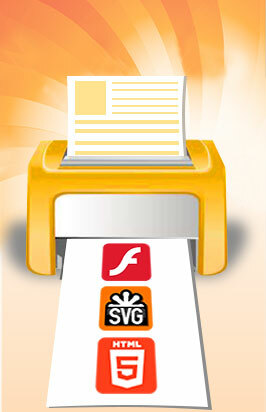 See How to Convert a Document to Print2Flash Format (Adobe ® Flash ® (SWF) File or HTML5 File)? to learn more about document conversion. After you saved the Print2Flash document as indicated in the previous chapter, it is as easy as a double click on the saved file to view it! You may also perform a number of other operations while viewing Print2Flash documents. See Converted Document Interface to learn more about this. There are also other options in publishing your document. See How to Publish the Document on the Web? to learn more about this.